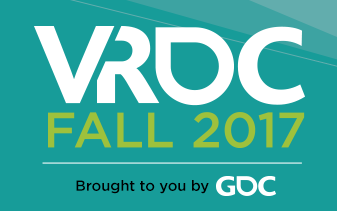 The Use Your Illusion: Creating Immersive Virtual Reality Worlds session at VRDC was a collection of modern VR pioneers that are helping to create the grammar of immersive VR. In virtual reality, nothing is more important to the experience than transportive destination and immersive space. Panelists Will Smith (FOO Show), Chris Pruett (Oculus VR), Adam Orth (ADR1FT) and Dirk Van Welden (Space Pirate Trainer) all went through their joys and pains in creating believable and immersive VR worlds. Named after the famous Guns And Roses double album Use Your Illusion this panel challenged both the panelists and the audience to continue to fail at perfecting VR as that is the only way we can stop looking at VR experience creation as a collection of mechanic implementations but truly as a new way to push the limits of immersion. Right now we are at a pace where the technology in the language of VR is changing rapidly. It is obvious the tech not there yet. Clearly there are technologies that can change the way and the way we perceive and interact with immersion. The tools in our hands right now are just a vague representation of the coming future of VR immersion. I am very glad the the creators involved in this panel have decided to make the leap in shaping the future of VR before the water becomes comfortable enough for full dive. Since the VRDC video of this session is not up yet I will add some videos showing the work of the people involved in the Use Your Illusion panel.